My friend John Wilke, a reporter for the Wall Street Journal, and one of the smartest no-nonsense journalists I ever had the good fortune to know, died today. A man who chose the news as the center of his professional life did an awful good job of keeping his own illness from being the news. I only learned of his trials with cancer a little more than a week ago. But for those of us who admired John as a man and as the defender of a resolute style of uncompromising reporting that is gradually ebbing I offer his family and friends my condolences and this memory. In 1985, John was still a reporter in Business Week’s Washington Bureau and just two years into the hard-nosed print journalism career that became his signature. John and I were in New York on a warm early spring evening where we were joined by John Herzfeld, another young writer making his way in an era marked by the firm conviction that the logical conclusion to smarts and hard work was a desk in one of the country’s major newsrooms. We were White Plains guys, born and raised. And along with our roots we shared the unlikely allegiance to good reporting and the interesting life that a journalism career could produce. That night was of particular interest to Wilke and to Herzfeld, his very close friend. Only a month before I’d spent a day with the editors of the Washington Bureau of the New York Times. Though the evening was filled with drink and talk and miles of ambling down Broadway and then Fifth Avenue and across Greenwich Village I vividly recall the underlying issue nagging both. When we reached Washington Square Wilke and Herzfeld, relentless intellectuals and virtuoso talkers both, honed in on questions of news principles and values, and the completely fathomless — even ridiculous — idea that one among them might become a Timesman. The mix of joy and pride and envy and interest was so authentic, so remarkably unbridled. So endearing. Those few hours bound a hometown friendship in a fraternity of professional progress that lasted a lifetime. Wilke, of course, went on to build one of the great business reporting careers of his generation. A 1983 graduate of the Columbia University School of Journalism, John reported for the Washington Post, Business Week, and joined the Boston Globe in 1986. 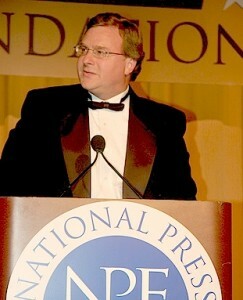 In 1989 he became a reporter in the Wall Street Journal’s Boston Bureau where he covered technology, and then moved to the Journal’s Washington Bureau in May 1995. He served as an investigative reporter and an editor, and in both capacities insisted on airtight reporting and unyielding fact checking. His work on law enforcement and government regulation, federal courts, and the Justice Department was regarded as definitive. In 2007, as a member of a Journal team reporting on the Hewlett-Packard spying scandal, he was a finalist for the Gerald Loeb Award for Distinguished Business and Financial Journalism from the University of California Anderson School of Management. The same year he won the National Press Foundation’s Everett McKinley Dirksen Award for Distinguished Reporting of Congress. The award recognizes journalists whose work shows thoughtful appraisal and insight into the workings of the U.S. Congress. The quality that I most admired about John was how funny and wry he could be. He brought that distinctive energy to his work. As a journalist he never encountered a soft underbelly he wasn’t willing to poke. And among those of us who knew him as a boy and as a man, John’s knowing grin, ready laugh, and formidable intellect always served to enlighten. John was a classmate of mine at Columbia (’83). As a class we have pretty well hung together and we were all a bit shocked at the news. Many thanks for writing such a touching tribute. Loved my little brother dearly. Was holding his head at the end. He passed very quickly from strong willed — and committed to beating it up to the very last — to gone. A little piece of the great struggle of his life for justice, truth and life. When, as the rabbis say, a person dies, a universe dies. For the whole of our experience is the beauty, joy and love that dances in our souls. When the synapses of the brain no longer fire, that is gone. But the earth and sky from which we wove that world still dance — we guess — all around us. They will embrace him, for the earth and sky are not, as we assume indifferent. They dance in love of all that is and ever was and will be, so long as the starlight from which we are woven still sings. I was not a close friend of Johns in High School. But we shared a lunch table one day and had a conversation that has stayed with me to this day. Without getting into all the details of what was said, I can say that when I walked away from that table, I felt I had had the first glimpse of man inside the boy. There was something very intelligent and grown up about this wild blond haired kid. He seemed, for lack of a better term, very serious about using his brain. I am proud of the way he used it and I am touched by Keith’s tribute. Peace. Thank you, Keith, for those kind words. Yesterday was a tough day. John passed away around noon. It was May Day and the dogwoods and azalea around his home were in full bloom, a riot of color. John was home surrounded by his family and kids and got to see his beloved Red Sox sweep the Yankees. Does life get much better than that? I’m not a journalist, just a long-time friend of John’s. Although we knew he was sick, his passing still came as a shock. All I can say is he was probably the nicest man I have ever met. There was certainly no one nicer. I grieve for Nancy and the kids, and the rest of his family that I didn’t know. He will never be forgotten! I got to know John while at BellSouth, my first job in public relations. I was always glad when he called, no matter the story. When John Wilkie called you to chew on a story he was working on, you regarded it as a badge of honor. John was a friend of mine during my high school days. Although we haven’t spoken in years, I am moved by his death. The last time I saw him I was sitting on the steps in front of my mother’s house, with my ankle in a cast (I broke it sliding into third base), and along comes John, just walking down the street. We talked for a few minutes about what was happening in his life and in mine. We were both in college, home for the summer. he still had long hair then. John came back into my consciousness some years later when I was covering tech biz at the San Francisco Chronicle and he was at the WSJ. I always found it amusing that we were on parallel paths. I’d heard John had cancer and a few days ago had a chance to ask Don Clark about him. Don passed on the saddening news that John was near death – then yesterday the news he had died. I am thinking of those days when I knew John, and hung out and played guitars with his brother David. And although I haven’t seen or spoken with John in many years, I grieve his loss. He was a good man and a good friend. Blessings, John. David, I’m thinking of you guys. I had the good fortune to work with John on a few stories at the Journal. He was always insightful, funny and eager to help however he could. After one story we were both proud of, he said, “Thanks for bringing me along for the ride.” No, John. Thank you. Thank you for being a great colleague and an inspiration to young reporters. This news has been devastating to me, although I have not seen or spoken to John or his sweet brother David for many, many years. Surprisingly, I had just been thinking about John. I had known both John and David in HS. They were both such talented, kind, intelligent, and interesting people. What is amazing to me, is that I have just (in this past month) reconnected with so many of our mutual friends – including Keith – who write this beautiful tribute to John; and on May 1st I started to think of other people who touched my life “back when” that I hadn’t yet connected to, and John came into my mind . . . and then Andy sent me this piece the next day, on May 2nd . . .
John had a presence, a sense of humor, a gift of intelligence. I remember him with long blond hair, wire-rim glasses, work boots, bluejeans, denim shirts . . . leaning against a wall, playing his guitar to John Lennon’s Working Class Hero. So when I heard, just yesterday, that he was a writer for the WSJ it was, suffice to say, surprising! But in a good way! I wish I had kept up with his success and passion all these years, even from afar. I am glad to know that his family and friends, all through his life, have been there with him and for him, loving him and appreciating the man, that this boy I once knew, became. My heart goes out to you, David, and Kit, and Mark, and all of his grieving, beloved family. Though I am a Washington journalist, I knew John in a different way. His son, Jackson, and my son, Ben, have been friends for years. John not only was a terrific father but he was very good to his son’s friends and on several occasions provided a listening ear to my son when he needed one. He was also funny and delightful, and I always enjoyed arranging car pools, etc., with him and Nancy. He leaves a big hole not only in Washington journalism circles but among the lives he touched in his community in Bethesda. We will miss him deeply. Wilke, what a loss of a fine man, talented reporter and friend. He was a such a damn good writer and tenacious researcher. I always planned out when and how I’d pitch him on a story. Late in the day was the best time for me to actually find Wilke at his desk. As a publicist for law firms, getting him interested was like getting an A. “What have you got for me” was music to my ears, especially when he’d say, “Can I have an exclusive on that?” And he surely took time to get his stories right. He’d follow the lead and dig deep. He was so fair, tough and loyal to his sources. And when one of his stories came out in the Journal, he’d always appreciate the feedback call. “Did you see I quoted your guy, what did you think of the story?” You will certainly be missed Wilke, you were one very unique reporter. Such a flood of memories…it’s taken me several days to sort out the various streams and begin to make some sense of this tragedy and my reactions to it. I’m one of the “White Plains born and bred” crew, and so my memories of John converge on those high school moments. Like Jean, I also remember him leaning against a wall, peering out from under that blond hair, thoroughly at home in the early 70’s denim and boots uniform. I only encountered him very briefly as an adult, when our professional interest in technology intersected — the shock on seeing him suited and short-haired makes me chuckle that he actually remarked on his own son’s tresses. The blonde mane (beautifully attended to, I might add) — seemed to me John’s nod to conventional vanity, and the feature that made even us wildly insecure, hormonally addled teenage girls wonder…. John’s passing has given me a wonderful insight into myself at that age. Even then, he was the kind of guy you knew, somewhere deep inside of yourself, you should love — that huge intellect, that great soul, that deep respect for smart women. But you were young, and surpassingly shallow and confused, and instead you longed for the bad boys, the beautiful boys, the ones who would always, always break your heart. John was the kind who never break your heart, and so what did we silly girls do? We broke his. I realize that John’s adult life traversed a golden age of journalism. He came up during the Watergate years, and made a career as a journalist’s journalist. He passed as the newspaper industry seems in danger of passing. I’m glad he was able to shine in the light of the past 30 years. Finally, I connect with John through my own pitched battle with cancer. Mine has been a saga, and it sounds as if his was all too brief. I’ve chronicled my journey for friends and family — including the White Plains circle through which I learned of his passing. It seems as if John kept his illness close. But I hope he used his passion for words to make some sense of it to his nearest and dearest. And I hope, if that wisdom has been preserved, they see fit to share it with us when the time is right. It’s Thanksgiving time in White Plains (the state of mind, not the city proper). Thanks, Keith, for your beautiful remembrance and for, if you will, breaking the story for all of us (although the meeting in question was in early summer, not early spring). And thanks, Jean and Judy, for the mental snapshot, circa 1972–you can see on the Wilke Way blog that the denim shirt was also his uniform in the WSJ newsroom. Corey Solomon, Ken Siegmann, out of the blue . . . and, in a real blessing, some words from the brothers Wilke. But thanks most of all to Jodi Schneider, whom I have never met, for giving us a look at John Wilke the husband and father. Of all the memories flooding by, I keep returning to a big Legal Seafoods takeout feast for Tanja and me on a visit to Dorchester, when Robin was little and Jackson a babe in arms — and to John and Nancy’s splendid wedding day, when, as now, the dogwoods were in bloom all over White Plains. For years, seeing dogwood blossoms would prompt me to call Wilke (rattle his cage, as he might say), to the point where even passing a certain dogwood-packed garden in Greenwich Village, in any season, would have me opening up the cellphone to dial (202) 862-6625, so I could hear that urgent voice at the other end of the line, answering: “Wilke!” That habit led to some valuable phone conversations in these last six months, I am (once again) thankful to say. I see all these comforting messages posted on the Internet as expressions of gratitude for our time with Wilke, a.k.a. Brother John. When I lost the first love of my life, Edgar, to some kind of violent death, John was still at Columbia. He took on the task of investigating Edgar’s death which took him into the world of the South Bronx. He used that story as his masters thesis, though he told me he didn’t think it was very good. But the fact that he did that was such a huge comfort to me and I’ll never forget it. John was like a big brother to me all the while we were growing up. While as adults we rarely saw each other, I’ve kept up through my brother and David. It’s amazing to me that one our own from WP achieved so much in his professional life and still managed to be the nice guy he always was. Hiis passing truly leaves a gaping hole in the world, for Nancy and the kids, for his brothers and mother, and for all his colleagues and friends. I remember John from school. Haven’t spoken to him since we graduated from high school. He was always kind. One of my memeories of him is skipping school together and walking on the train tracks with him. Dont remember why we did that but he showing me things about the tracks. He achieved success that so many of us dream about but never are able to achieve. Keith, this is a fine tribute to John, whom I met in fifth grade at Post Road Elementary School when we moved to his neighborhood in White Plains. Like John, I was a French horn player. Like John, I was the neighborhood’s newspaper delivery boy — I took over from him, in fact. I haven’t seen John since high school, but I was fascinated to learn how accomplished he was. Thank you for writing this. By coincidence, I received this link from my sister just after I returned to my hotel after meeting Ethan Schulman for lunch while in San Francisco. Ethan mentioned you, by the way. And as you know, Ethan is another former horn player. I look at the previous commenters, some of whom I know, and it makes me regret I haven’t kept up with my fellow WPHS grads. I certainly wish I had kept up with John. Next PostNext Can Electric Whirr Save The American Auto Industry?